I have been taking a nice break from doll sewing lately. I made my husband a shirt and then it was my turn for some new things. My patterns arrived from Decades of Style and when Ethel's hand crank arrived, some seam allowance measurement stickers came along with it. These make it much easier to maintain accurate seam allowances on my vintage machines. Equipped with the proper supplies I set to work making myself a 1944 house dress and a 1920's apron. First, the apron. This is decades of style pattern #2802. It's pretty good and comes with a child size pattern. I didn't need to use the tie pieces, I just fixed a button to the back and it fits perfectly. 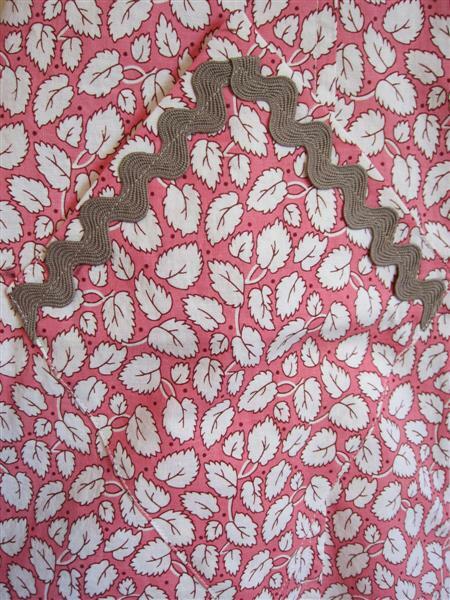 I also shortened the shoulder straps on the pattern piece before cutting my fabric. After it was finished I found it was flaring a lot around the back of the neck so I took it in and made a triangular pleat to flatten it. 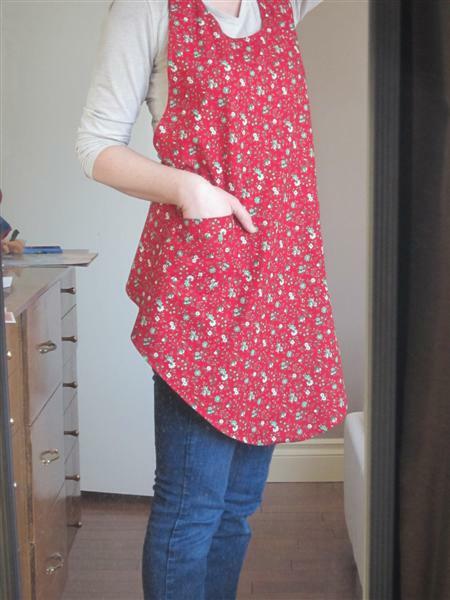 This apron was made entirely on my hand crank powered Singer 128-13 (Ethel.) I really enjoyed doing this, I am continually amazed at the precise top stitching I can do on these old Singers. I could never get this degree of perfection on any zig zag machine I have ever had. It's so consistent and I can get so close to the edge quite easily because I can actually see where I am going and exactly where the next stitch will go. Those zig zagger feet make it very difficult to really see what is happening and the giant hole underneath them makes it difficult to turn a corner so close to the edge too. 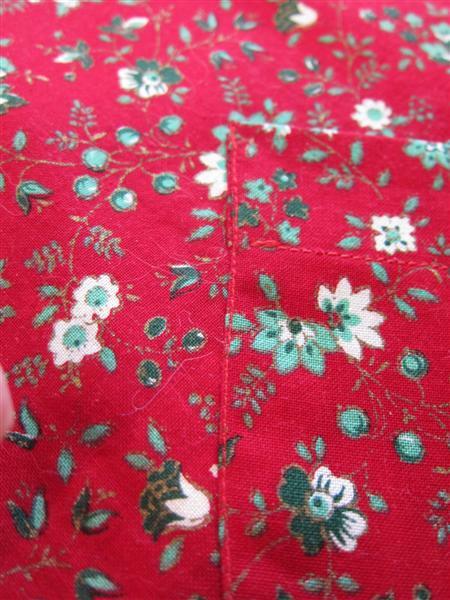 Here is a picture of one of the pockets on this apron to show you what I mean. Since this is just a single layer apron I did a 1/4" double rolled hem all the way around. I really like it and will make a couple more to wear with different outfits. 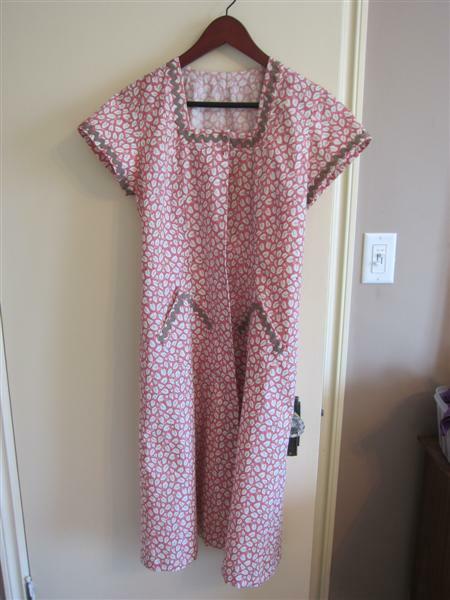 This is my first crack at Decades of style pattern #4002 the 1944 house dress. I like the fabric and the rick rack but I'm definitely going to make another in a fabric that I might actually wear out of the house. Maybe to the playground. I don't have a dress form to show how it fits and I can't wear it for pictures yet because I don't have appropriate buttons for it today. It's very cute on, loosely fitted and it accentuates the waist. It is made up of 7 shaped gored panels which makes for plenty of seams inside. I made this dress entirely on my 1927 Singer 99k. This one is called Aunt Millie and she has a knee bar powered electric motor. 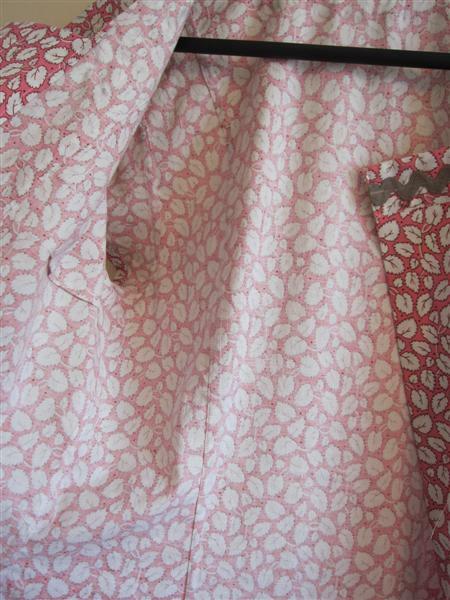 With no zig zag or reverse function I got to practice fine garment making and I made a lot of flat felled seams. 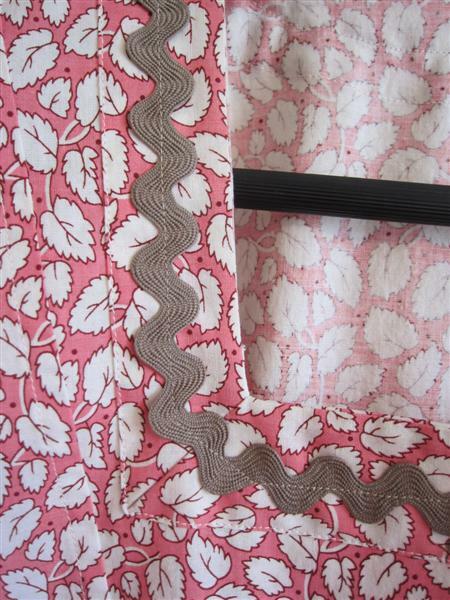 Every seam in this dress is finished this way, even the curved armscye. It's just as neat inside as it is on the outside. My mom always told me a well made garment should. She's right, too. I think this dress will last me a long time. I love the rick rack. I wasn't sure about this color but the store didn't have a lot of options. 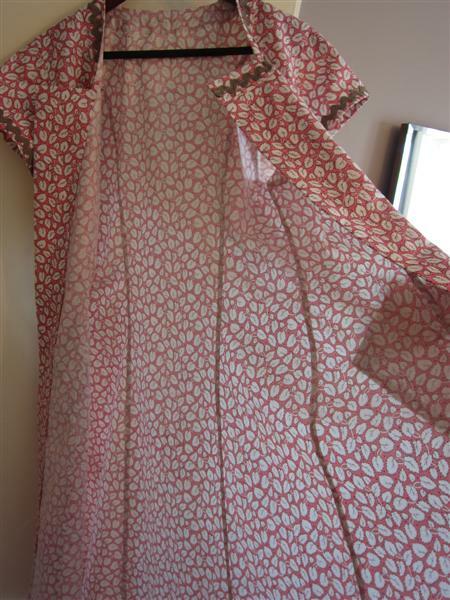 It works well enough for me, but the buttons will be pink to match the fabric. You can sort of see the flat felled seams here. It's neat not having any raw edges or bulky serged edges. It's completely flat and smooth. I'll be needing a slip next. Inside the sleeve. They are roomy but not over sized. 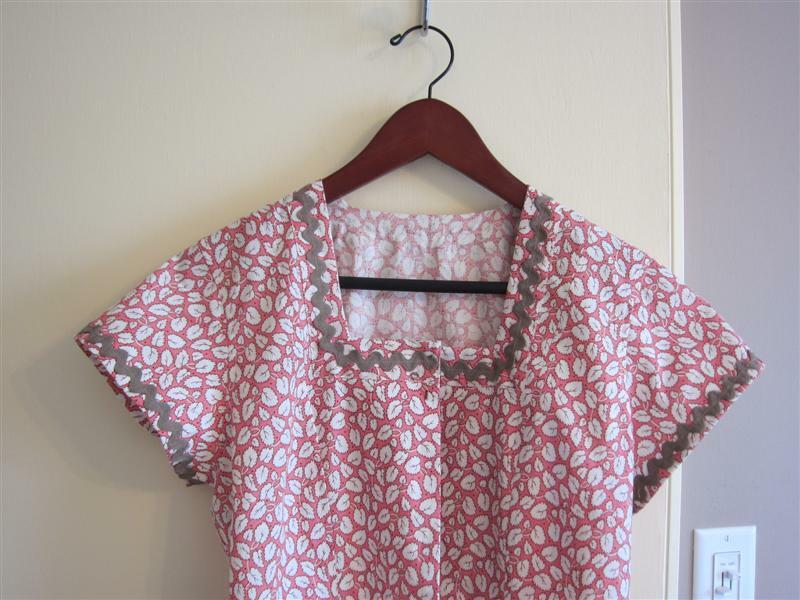 Mitered corner at the neckline with rick rack trim. Top stitching comes so naturally to Aunt Millie. It's like she's been doing it all her 84 years. 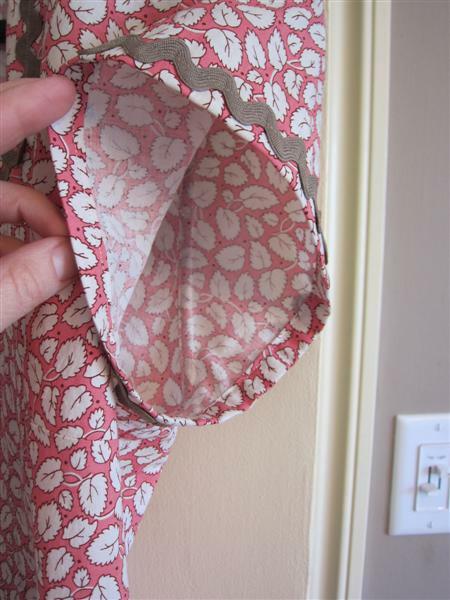 One of the pockets. I think I am going to put buttons on these to hold them up. The points flop down and look weird so a button below the top corner of the rick rack should do the trick. I totally want to see a pic of you wearing the dress! It looks so comfy. Molly's new dress and Ethel gets cranky.